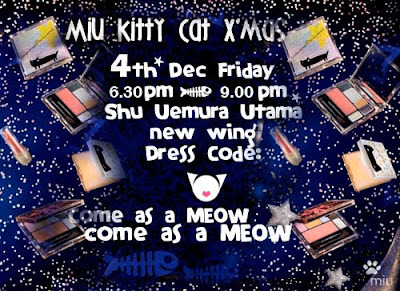 The dateline to submit your entries to be one of the 15 followers to attend the Shu Uemura Tsumori Chisato @ Miu's Kitty Cat Party is coming to an end! The dateline for contest submission has been brought forward to 28th November, 2009 to enable followers to prepare and find their cat costumes in time for the party on 4/12/09. You can make, rent, or be creative so as long you rock as a cat! to submit an entry to be selected as one of the lucky 15 followers click here. There's two Contests for this Party! Come show off your Kitty Cat Costume, complete with your own party makeup using the Tsumori Chisato collection (hands on party makeup using Tsumori Chisato is one of the activities in this party). The Best Kitty Cat Costume & Party Make up wins a Shu Uemura Hamper worth RM400!~ meow! Start posing! If you miss out the Best Kitty Award, you still can participate in the Best Kitty Pose Contest which will be on Miu's blog for voting. Remember to have your picture taken to qualify! Meow!!! Shu Uemura Hamper worth RM400 for the besssst meooooowww pose! Come bare face coz at this Kitty Cat party 15 followers will get to play with Tsumori Chisato's makeup collection and learn how to do a party makeup from the cute Shu Uemura's international makeup artist Frederick Ng! Enjoy Catails and mingle around with the cat pack! Talk to Miu or Shu Uemura! It's time to get to know this Kitty better :) show off your fancy cat costumes to me! Ask me about blogging tips, advise or what's rocking to buy! For every RM100 purchase, you can get to make a star wish! Write down on that star your favourite Shu Uemura product and why. U never know, your lucky star might be smiling on u! MEOW! top secret that you will only know on that day! Also every guests will be given a door gift from Shu Uemura! thank u Shu Uemura! meoww! ALSO IF YOU ARE A CITIBANK CREDIT CARD HOLDER! 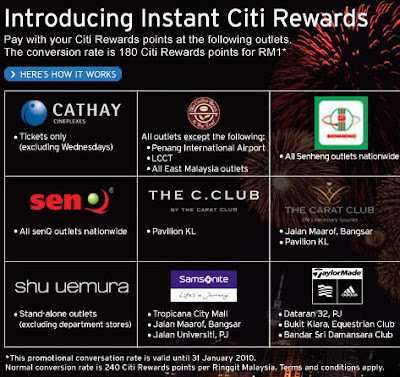 Therefore, if your item is valued at RM20, just use 3,600 Citi Rewards points. If you don't have sufficient Citi Rewards points, the balance will be charged to your Citibank credit card automically. The guest list will be up by end of this week :) Are u MEOW ENOUGH? let's see. i wanna go for this party with the stars!!! i've enter your party post!! YeAP i used my citipointss hurrah! arghh...my dad card got 3xxxxxx points! but I can't use his card without him with me right?? arghhh! have to use my own cash to buy things on that day liao..sob..
By the way, I really dunno what else I should get besides the planet ribbon lerr..cox I already bought what I wan during the preview party! Will ask for your suggestion on that day! for me i want to collect the whole collection!!! especially coz it's kitty on it... i am kitty.. sob sob..
Not too worry Jean you can redeem your citipoints for anything in SHU! no..the collection makeup product i got glosses only, plan to get the ribbon planet because i like the ribbon box..but not planning to get two palettes lerr (so will oni get either ribbon one, or cat one~)..
stellar: lol! yea i noe it's so cool, i'm gona buy liek 1 or 2 more to keep/as gifts. It's actually worth rm282 now!! (Coz of the usd dollar risen up) but still rm198 here. Citibanks - anything :) in shu! Jean.